The follow up to 2009’s Sick is an improvement in my book although it is the same mix of radio rock, metal, alternative rock, punk and rock/pop. I wasn’t extremely impressed by Sick but I guess I’m at the point where I’ll support any of the core GNR members just as long as they physically get their music out there (sorry, Izzy, not messing with iTunes). A number of songs on the album remind me of the Foo Fighters. “We Win” is certainly an anthem that could’ve been written by Grohl & Co. and it’s done well being licensed out for use by MLB and ESPN. “Indian Summer” sounds like one of FF’s more easy going moments. There are also some true metal moments like “Executioner’s Song” (something I could imagine from Death Magnetic), But of course with Duff’s roots being in punk, those influences shine through on a songs like “Follow Me to Hell” and “King of the World”. I’ve found myself really enjoying this album the more I’ve listened to it but personally I would love for Duff to go back to a Believe In Me/Guns ‘N Roses sound. The closest he comes to doing that is on the swaggering “Cocaine” (original song, not a cover) . All told, The Taking is a pretty good album and in the absence of working together in some fashion I’m perfectly fine with Duff & Slash release solo material. Buy ‘The Taking’ at Amazon.com! 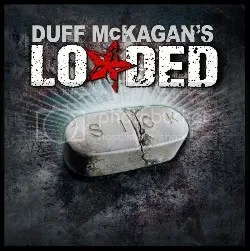 This is a solid outing from Duff’s side project Loaded (though I think the official name is now Duff McKagan’s Loaded). I like “Sleaze Factory” and “Flatline” a lot, both of which seem like they would play well on radio. There’s a mix of everything here. Duff let’s his punk side shine through a bit with songs like “The Stride” and “No More” (which actually is a bit punk pop) and he also enters Velvet Revolver territory with “I See Through You” & “Forgive Me” and then goes back to his GNR days with bluesy numbers like “Wasted Heart” and “No Shame”. My biggest gripe is “Mother’s Day”. It’s a very slow, cheesy song that I can imagine hearing during some “reflective” scene of some teen drama on The CW and it disrupts the flow of the album. I think the album could’ve been stronger if Duff really focused on one style of rock instead of doing a bit VR, a bit GNR, a bit punk, a bit modern hard rock, a bit rock/pop, etc. I guess I can’t totally know it thoubgh, because in a way, it’s refreshing. The album is definitely “good”, but I just think it could’ve been better. I would’ve loved to have heard something closer to his 1993 solo release Believe In Me. Still, there’s tons to be found here worth listening to over and over again.